Ash-Sham revolution continues to make sacrifices after sacrifices, and its sons are still doing their utmost to be honored by Allah’s fulfillment of His promise, a glorious victory or a garden as wide as the heavens and earth, prepared for the righteous. On Tuesday, the 8th of Rabii’ Al-Akhir 1439 AH corresponding to 26/12/2017, Ash-Sham bid farewell to one of its dutiful sons, the thirty-three-year-old Mujahid, the well-mannered, Abu Abdelrahim, a resident of Jobar neighborhood in Damascus and the father of four children, after he was wounded by one of the criminal missiles launched by the criminal Assad’s regime on the neighborhoods of As-Sham and its cities. Abu Abdelrahim Jobar, known to the residents of Jobar neighborhood, was one of the first young people who revolted against the Assad regime and worked to overthrow him. He had been imprisoned twice since the beginning of the revolution for nearly two years. After his release from prison, he was not discouraged from continuing the march. So, he worked with Hizb ut Tahrir following the method of the Messenger of Allah ﷺ, and guided by his guidance, which draws the path to overthrow the regime and the establishment of the Khilafah Rashidah (righteous Caliphate) state on the method of the Prophethood. We, in the Media Office of Hizb ut Tahrir Wilayah of Syria, as we mourn to the Ummah the martyrdom of the young man, Abu Abdelrahim, we affirm that his blood and the blood of his fellow Muslims in Ash-Sham will not be wasted and will remain a curse on anyone who accepts to make it a cheap commodity sold in the markets of slavery and the shame conferences of Geneva, Riyadh, Astana, Sochi and others. This blood is offered by the people of Ash-Sham in the cause of Allah, so that the word of Allah is supreme. In Ash-Sham there are men like Abu Abdelrahim, who will not sell the sacrifices of their people, and will not accept inferiority in their religion, enduring on the covenant and persisting in their march on the methodology of the Messenger of Allah ﷺ until Allah honors them with His victory, He is the Protector (Walli) of that and He is the Competent of it. 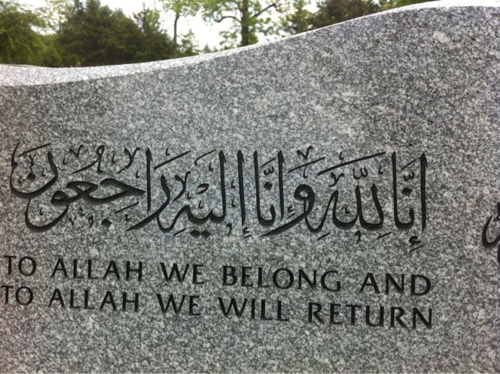 We are in sorrow for losing you, O Abu Abdelrahim. We ask Allah to accept from you your good deeds and to gather you with the prophets, the steadfast affirmers of truth, the martyrs and the righteous. And excellent are those as companions.